Take to the sky well fed, well rested and ready for anything. Our unlimited breakfast spread (included in your room rate) is hard to beat, and it's available from 5am for early departures. The on-site restaurant serves snacks all day and à la carte treats in the evening, plus our cosy, welcoming bar is a great place to kick back and contemplate the adventure ahead. We've got your every need covered throughout your stay, including free fibre Wi-Fi, a 24hr reception service. From the moment you step into the lobby - designed to emulate the wing of a plane - to the minute you settle into your creatively decorated bedroom, you'll travel through the history of flight within a pleasantly peaceful environment. Located in Hayes, about 10 miles from Windsor, ibis Styles London Heathrow Airport offers easy access to magnetic local attractions, including Legoland Windsor, Thorpe Park and Royal Ascot - all within 13 miles of the hotel. Located in Hayes, about 10 miles from Windsor, ibis Styles London Heathrow Airport offers easy access to magnetic local attractions, including Legoland Windsor, Thorpe Park and Royal Ascot - all within 13 miles of the hotel. 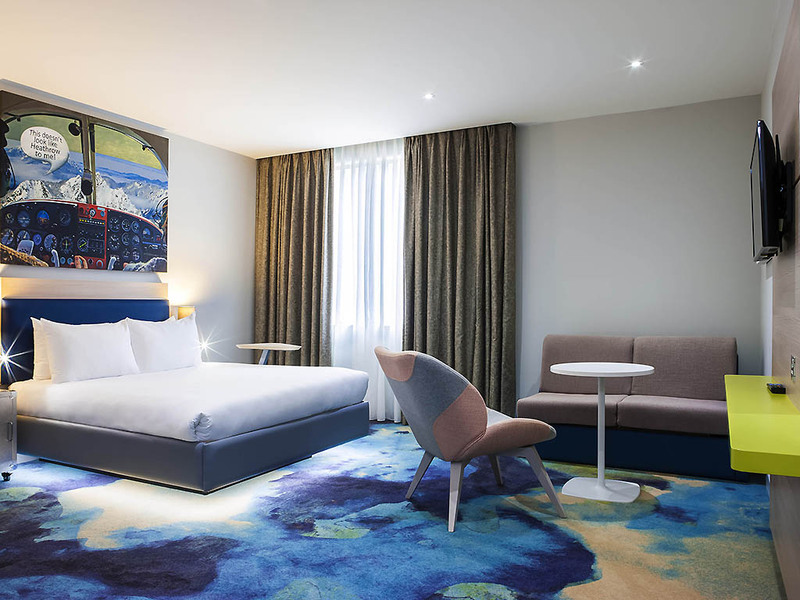 All 140 bedrooms have air conditioning, tea and coffee making facilities, hairdryer, free WiFi and the Sweet Bed by ibis Styles which is designed, tested and perfected for the ultimate sleep. Welcome to the Westcombe Bistro where international cuisine and a relaxed, cosy atmosphere are the orders of the day. Open from early morning well into the evening, join us for light lunches, afternoon tea and lazy à la carte dinners. Relax in our spacious, modern bar for a journey through aviation history with a refreshing tipple in hand. Sink into a cosy armchair or pull up a stool at the bar: our friendly staff is on hand to provide a warm welcome. Basic hotel that is just a bit too basic. I booked to stay at the Ibis Styles instead of the usual Ibis as I’d heard it was much better. I just think it’s been paired back just a bit too much. The staff are great; all very helpful and friendly without exception. Problems, My room was in the annex, at the bottom of the annex staircase is a fire door which has the smoking area outside it. So the smoke drifts up into the general area. The shower was Luke warm. Maintenance came to fix it the next day but instead made it so hot it was dangerous. You couldn’t reduce the temperature. Maintenance returned and put it back to Luke warm. The pillows in the room are too hard with no options. The carpet in the room had shrunk so there was a gap along the walls. The pattern was such that it looked like it was badly stained and dirty. The noise suppression from the airport wasn’t very good compared to modern standards. Breakfast was nice but furnishings just a bit too stark. I think next time I wish to stay at a budget hotel at Heathrow Ill return to the Ibis. Very good indeed, would recommend. Friendly and efficient with a very good night's sleep. The room was a good size, comfortable bed, some noise from the planes. Room was very modern. I was upgraded, even though upgrade is not necessary at Ibis. So that was above and beyond. room is clean and confortable. I like ibis hotels . good room and bood breakfast eveywhere. Quick check in. Nice breakfast - no watery scrambled eggs. Small car park. Clean room. Very small rooms. Quiet and cmfortable room but the bed is too firm and the pillows were too high for someone who is petite. Overall we had a nice stay, however we would have been more comfortable if the bed hadn't been so firm! I travel with a camping mattress that inflates and used that but still found the bed to be very firm. My husband who travels for a living also found the bed to be very firm and had trouble with his hips, neither of us are large people. The room was quiet, clean, and the bathroom had ample space. Couldn't find fault with it. Reception were first class in handling our requirements. We needed a room close to the lifts so they upgraded us and moved us from the allocated first floor to the second without hesitation. The club sandwich from the menu comes with fries... massive, I couldn't eat it all - I thought the food was good, contrary to some reviews I'd read prior to booking this stay. I asked reception to book a taxi to the airport and it was reliably taken care of. The following morning, we used the express checkout when the taxi arrived early and reached our destination in good time. Thank you for a most enjoyable stay. We stayed here for one night only as we had an early flight the next morning. The room was clean, spacious and the beds were very comfortable. There was a good selection at breakfast. It was an ideal location for the airport. Room was small for 4 people even though 2 were children aged 9 and 16 Two towels provided so had to ask for more Sofa bed quite small, recommend placing 2 beds in room and not sofa bed. Good location, bus stop right outside with connections to a variety of places. Clean & well equipped. The room was small but had everything we needed & much cleaner than other London hotels where I've stayed at more than twice the price. The reception & breakfast staff were friendly & efficient. I'd happily stay here again. I paid 4 x the price of the Ibis the following evening at a hotel joined to Heathrow and it was rubbish compared to my stay with you guys. Thanks! The staff was very friendly and super helpful. The room and shower room / toilet were immaculate and well designed. Bed was very comfortable. Great experience and will stay again for next time! We came from Australia and needed somewhere close to the airport for a night stay before flying onward the next day. I found out about the hotel on Trip Advisor and we thought it was fantastic! The lady at the bar was so welcoming, the man on reception very helpful. The room absolutely exceeded expectations and the price was very affordable. We also loved the selection at breakfast! Very nice, clean, modern hotel with close proximity to airport at a great price. Stayed for just the night but it was really conveniently located for an early morning flight.